After overcoming the hobgoblin ambush at the edge of Neverwinter Woods, the group went back to deal with the trail of bodies. The group made their way back to the smoldering remains of the hobgoblin band, and then beyond to the trail of dead hobgoblins that trickled off into the distance. After almost an hour they reached the place where the first hobgoblins fell and found that one of them was still alive. Turenim was eager to question him, but just as Lee began to object, they spotted some hobgoblins up ahead running towards the tree line of Neverwinter wood. Moula, Turenim, and Pippin took off after them, with the monk racing ahead and closing the distance. Lee took the opportunity to finish off the unconscious hobgoblin, and then advanced slowly as he shot at the other retreating hobgoblins with his bow. Pippin also shot with his short bow as he ran, not letting them increase the distance. Atilius advanced slowly towards them, but they were well in range of his spell-snipered firebolt. The retreating hobgoblins were soon out of Lee's range, but Pippin managed to hit two of them while he ran, dropping one. Atilius hit one with his firebolt, killing it. Moula eventually caught up to them. Racing past one, she dropped it with a swing of her staff to the back of its head. The other turned towards her as she hit it with a flying knee. Watching all this was a half-elf, who now emerged from the woods and introduced himself as Albrecht. The group questioned him and learned that he was trying to find a drow in relation to the disappearance of his lost love. The trail took him to the ruins of Thundertree where he met the druid Reidoth, who showed him how to fight the undead there and saved him from confronting the dragon. Reidoth then sent him to Cragmaw Castle, where he met Snowg, the King of the Cragmaw Tribe, and his goblin companions, and narrowly avoided a confrontation with an owlbear. Snowg had told him that the heroes, led by Turenim, were also hunting a The Black Spider. 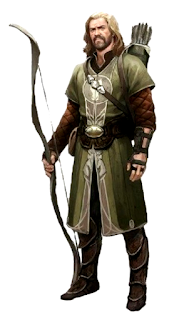 Julious pointed out that they were both sent by Reidoth, and asked him about his encounter with Reidoth, pointing out that it was helpful, as is the way with The Emerald Enclave. Ultimately they agreed to travel to Phandalin together. Turenim questioned the last hobgoblin, asking it who sent them. The hobgoblin, Ulbrug, was reluctant to give up any information until Lee promised that they would let it go. The hobgoblin told the group that they were sent by The Black Spider, who told them that the party, with the help of the traitorous goblin known as Droop, had overthrown Cragmaw Castle and killed King Grol. Ever since they had been waiting on the edge of the woods for the party to leave Neverwinter Woods. The drow told them where the humans would be headed. The group took the hobgoblin's weapons and let him go, and he fled back into the woods. Turenim bandaged everyone's wounds and they made their way back towards Phandalin. On their way, Pippin searched the hobgoblins' bodies and collected their loot, giving it to Moula for holding. Lee scavenged as many arrows as he could carry. Gundren told them that once they reached Phandalin, he would have a contract drawn up granting them salvage rights to the mine and a 10% commission of all future mining operations. By nightfall, they reached the Triboar Trail and they made camp nearby. The next day the group arrived at Phandalin early in the day. Moula, Atilius, Gundren, and Turenim went to the Town Master's Hall to find Sildar while everyone else went to The Stonehill Inn. At the inn, Elsa was thrilled to see the heroes and hear about their adventures, which they were happy to share. Albrecht began to play a song on his fiddle, and Elsa suggested that soon they would be singing songs about the heroes, who should be called the Heroes of Phandalin instead of the Lost Minds of Phandalin, which is what people have been referring to them as. Toblen suggested Elsa take it easy having just recovered, but Elsa was glad she recovered from being sick in time to greet the heroes. She continued to ask them about their exploits and their future plans. Meanwhile, the rest of the group found Sildar at the Town Master's Hall with Harbin and Halia. Sildar jumped up at the sight of Gundren and they embraced. Sildar congratulated them for rescuing Gundren, who told Sildar what had transpired and how they had helped him. Moula gave him his sword and armor she had retrieved from Cragmaw Castle and he was even more grateful. As they were talking and celebrating, people were wandering in and out of the hall and Sildar explained that they arrived just in time for the vote for the town mayor. At the mention of this, Harbin already looked defeated. Sildar explained that Halia was originally going to run as well, but he had struck a deal with her to use the town's coffers to subsidize the meals of the miners. Meanwhile, Albrecht was stunned and speechless. Halia was the spitting image of his fiancée, Edith Lestrange. Finally he turned to his companions, "By any chance do any of you know who she is?" he asked. "Oh yeah," Pippin replied. "That's Halia Thornton. I know who she is. She's awesome!" Turning to Halia, Albrecht finally asked, "Excuse me, Halia. By any chance do you recognize me?" "No," she replied casually. "Should I?" "It's just that... you look like someone I knew once." Albrecht responded. "You look just like her. It's scary actually." "Well that's not the first time I've been described as scary." Halia quipped. Sildar interrupted the awkward silence. "Are you here to vote?" They all cast their votes for Sildar and returned to the inn to tell the others about the election. They all ate, and all except Moula took turns bathing in their rooms. Lee, Pippin, and Albrecht went to the Town Master's Hall to cast their votes, and Julious followed along with no interest in voting Harbin objected to Pippin or Albrecht voting in the election, and after Pippin's insistence they allowed him to cast his vote in a special ballot box. Gundren, Sildar, and the group reminisced about the events that transpired less than a week ago when they struck a deal to bring a wagon of supplies from Neverwinter to Phandalin. By means beholden to our respective professions, we hereby enter into an Agreement with the esteemed Gundren Rockseeker of the venerable Rockseeker Clan, Fourth Under-Alderman of Gauntlgrym, Master Miner, Proprietor of Rockseeker Mining Limited, to render the formerly Lost Mine of Phandelver, also known as Wave Echo Cave, known hereafter as The Mine, safe and suitable for commercial and industrial mining and extraction operations. Duly do we understand that for adhesion to the above stated Agreement and in remuneration for services to be rendered, one Gundren Rockseeker solemnly declares to grant Salvage Rights* and a Ten Percent (10%) Share in all future rights and profits of The Mine (and any subsidiaries thereof). We further understand that Gundren Rockseeker and affiliate members of the Rockseeker Clan and Rockseeker Mining Limited decline all responsibility for injuries, debilitating conditions (including but not limited to: disease, blindness, madness, paralysis, poisoning, petrification, transmutation, temporal stasis, or depletion of life-force), imprisonment, blood feud(s), extra-planar complications, oaths of sobriety, death and undeath. Therefore, we formally assume all responsibility for the conduct and success of the aforementioned reclamation expedition. We officially engage to keep The Mine in good custody, and in good standing, to the best of our capacities, without altering its architecture or content (except where noted above) or allowing any persons excepting one Gundren Rockseeker, and his affiliates and proxies in Clan Rockseeker and Rockseeker Mining Limited, to have temporary, recurring, or persistent access to The Mine. We also profess to understand that this contract is for official use, to facilitate the accomplishment of these constituent tasks in the service of one Gundren Rockseeker, and remembering that this document can be used in strict observance of any relevant laws and regulations in force, and finally, that no part of this Agreement may be construed to mean that Gundren Rockseeker has ceded any land acreage, mineral, mining, or extraction rights to The Mine, except as lien against the share of future rights promised herein. We, the undersigned, under penalty of perjury, hereby solemnly declare that the statements herein contained are true and correct, and that we enter into this contract of free will, under no enchantment, either mystical or otherwise, and without any threat of force laid upon us. *Salvage Rights as limited by the Laws of Old Delzoun require all acquisitions to be declared and approved before the rightful laird. Therefore, it is to be understood by the undersigned of this document that violation of any accorded Salvage Rights will be considered a deprivation of property by deceit and tried as a godsfrown. So entered on 29 Alturiak, 1488 DR, Year of Dwarvenkind Reborn. After some debate, the group signed the contract and Gundren provided the group with directions to Wave Echo Cavern, less than half a day's march west. Soon after, they said their goodbyes and headed out of town, even though it was already late in the day and the sun was beginning to set in the horizon. However, they didn't make it very far. As they were walking down the southern west road, towards Alderleaf Farm, they heard the cry of help, followed by young Carp, who came running into town. Seeing the group, he called to them, "Come quick! It's Elsa!" They followed Carp past the farm, into the woods south of Tresandor Manor. In the woods he led them to a corpse that appeared to have been dragged out from a shallow grave. They recognized the body of Elsa, the gossipy barmaid they had just been recounting their tales of heroics to. Turenim prepared to cast spare the dying, but examining her body found that she had been dead for days! Shocked at the ramifications of this turn of events, the group ran back to the inn, with Turenim hanging back to cast gentle repose. Then he picked up her corpse and followed to the inn. Once in the inn, "Where's Elsa?" Lee yelled to Toblen, and the inn's patrons. "I think she's upstairs cleaning up." Toblen replied. Moula dashed up the stairs with the group following as close as they could. She searched the rooms, but found no one. She noted that there were open windows, but looking out them, did not see anyone trying to escape. Back down the steps, "Have you seen anyone leaving here that you didn't recognize?" Lee asked. "No." Toblen responded. "Not that I didn't recognize. Why? What's the matter?" "It's Elsa! She's dead. We just found her body, and she's been dead for days!" Toblen and the rest of the patrons were shocked, not knowing what to make of this news. "We've got to go!" Lee said, and they left the inn, and met up with Turenim, who had just dropped off Elsa's body at the Town Master's Hall and explained the events to Sildar. Now the group was more anxious than ever to make it to the lost mine as soon as possible. Once again, the group made their way out of town, with arguments and accusations about telling Elsa all their exploits and plans. There was a communal sense of foolishness within the group on reflection of the fame "Elsa" had promised. And further arguments about not casting blame and arguing. Some sorrowful and reflective, but uneventful, hours later, Lee was navigating by the light of the moon and stars until they found the clearing indicated on Gundren's directions. The air was dank, and there was an oppressive pall over the clearing — as if something evil was watching and waiting to pounce upon the unwary. Bare, dead trees dotted the landscape, and upon one a vulture perched, gazing hungrily at the unwelcome visitors. A flock of ravens rose, croaking from the ground, and the beat of their wings and their cries were magnified by the terrain to sound loud and horrible. Scattered among the rubble, boulders, and deadwood, bits of gleaming ivory and white littered the area. 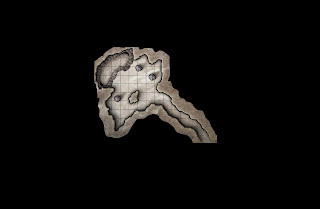 A closer inspection revealed that these were bones and skulls of dwarves, orcs, and other things leading to a narrow tunnel whose entrance was hidden within the Sword Mountain foothills, right where Gundren's directions said it would be. As they approached the dark entrance, a cool, damp breeze issued from the cave's mouth, as if it were exhaling, trying to ward off all intruders. Turenim cast light on a rock so they could see inside. The tunnel led deep into the hillside, perhaps two hundred feet, sloping slightly downward as it headed northeast. Then it opened into a large cavern supported by pillars of rock, but the chamber had collapsed along the north and east wall, forming a deep rift in the floor. Peering down into the collapsed cavern they saw a ten-foot-wide, twenty-foot-deep pit. A sturdy hemp rope was tied off around a nearby stalagmite, dangling down the side of the pit, at the bottom of which were a pair of rough-hewn tunnels heading northwest and east. In the western part of the cave, behind the column of rock, they spotted three bedrolls and a heap of ordinary supplies. Nearby lay the bodies of two goblins and a stout dwarf. There was evidence of a violent struggle. Examining the dwarf they saw an obvious resemblance to Gundren and knew this must be one of the Rockseeker brothers. Turenim noted that the bodies appeared to be dead for almost a week. The group decided it was too late to venture farther into the cave, and decided to use this place as a campsite. Pippin looked through the supplies, which included sacks of flour, bags of salt, casks of salted meat, lanterns, flasks of lamp oil, pickaxes, shovels, and other gear. Moula noticed that the dwarf's boots were unusually clean for the terrain and circumstances. She examined them, but could not find anything unusual about them. She asked Atilius to inspect them. Pulling out his magic book he cast identify and determined that they were boots of striding and springing. Announcing this, it was decided that Pippin should wear them. The group ate their final meal of the day and spent the time arguing about the level of violence they should exhibit as they ventured into what was clearly the most dangerous place any of them had ever been.